That's Amelie grinning from ear to ear at the very thought of starting school. Obviously she's hiding it well, but she doesn't like to get over-excited. She's more the chilled-out, introverted type. At least she is in my dreams. To be honest, I don't think she really wanted her photo taken. As a general rule, Amelie's 100% dedicated to the attention-seeking lifestyle for about 23 hours and 45 minutes a day. I just happened to catch her during her 15 minute break. The moment I tried to give her my undivided attention with a camera, she wouldn't play ball. Although if I'd asked her to play ball, she'd have jumped at the chance. Repeatedly, and off the sofa. Anyhoo, Lisa struggles to get herself ready on time for pretty much everything, but when it comes to our daughter, her preparation skills are immaculate. 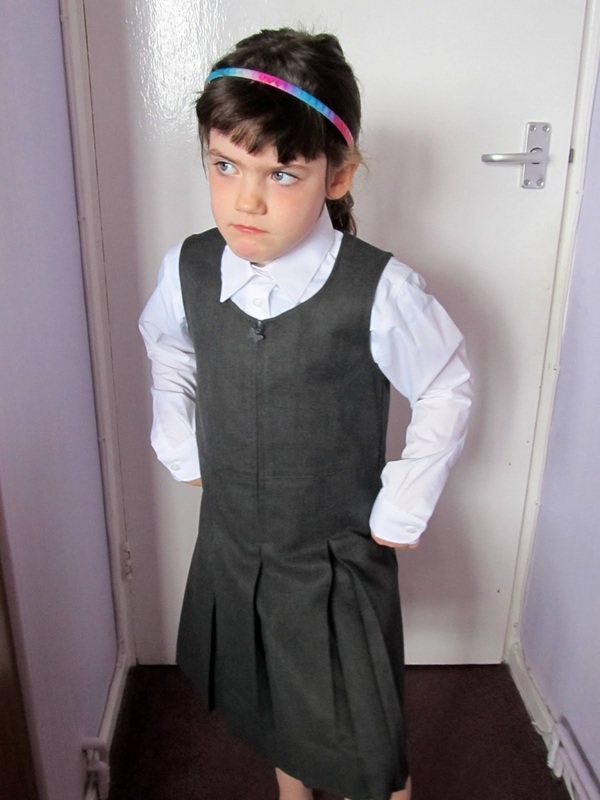 Amelie doesn't start school for another three months, but Lisa's already got her uniform. The girl's currently four-and-a-half, and the uniform's age 6-7, so there's every chance she'll have grown out of it by September. She's already wearing pyjamas that are age 7-8. I'm thinking of getting her work in a freak show. Needless to say, the multi-coloured hairband isn't part of the Catholic dress code, so the hands-on-hips pouting should come in useful when they start telling her she can't accessorise. I'm expecting a tantrum when she's banned from wearing her Cowgirl hat in the classroom. That's all very lovely, but sadly it's for Monday of next week. Which is when we go on holiday. We're planning to leave for Devon at 9am, so by 2 o'clock in the afternoon we'll be about three miles outside of Brighton, arguing about who to blame for our tardiness. There's no way we can make the meeting as well. Fortunately they're also holding a couple of "informal sessions" (which sound right up Amelie's street) in late June and early July, so we'll be attending those instead. It should be an interesting experience. I bet no child has ever been expelled before they've actually started school, so it gives Amelie something to aim for. It looks like we need to stretch her arms before September. I'll hang her from the monkey bars on our seafront next weekend.